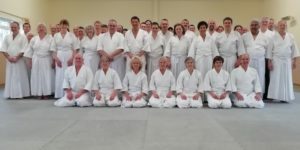 Here is the Ki Federation's Aikido update October 2017. We hope all is well with our members and that no-one has had a problem with the recent gales that swept across the Atlantic. It was good to see all our 5th and 6th Dans on their group course and we thank Jeremy Baile for taking all the photographs of the course. We require Dan Grades to make ukemi on the Grading at the Christmas course 9th December, so please let the office know if you are available. The invitations for Dan Gradings have now gone out to all teachers who had members ready for 2018. Please contact Sensei Margaret if there are any missing, and also if a date is required for a member to take their re-grade. Thank you to all who helped and contributed to the Macmillan coffee morning, held at headquarters. A total of £300 was raised for the Macmillan Cancer Support charity.